This helpful guide will show you 'How To Make' Body Splash using simple steps for beginners. Create a work space that is clean of filth and of a size that prevents contamination from outside sources. Select an area that is not accessible to children and pets. We recommend wearing protective clothing such as an apron, goggles, gloves and a hair net. 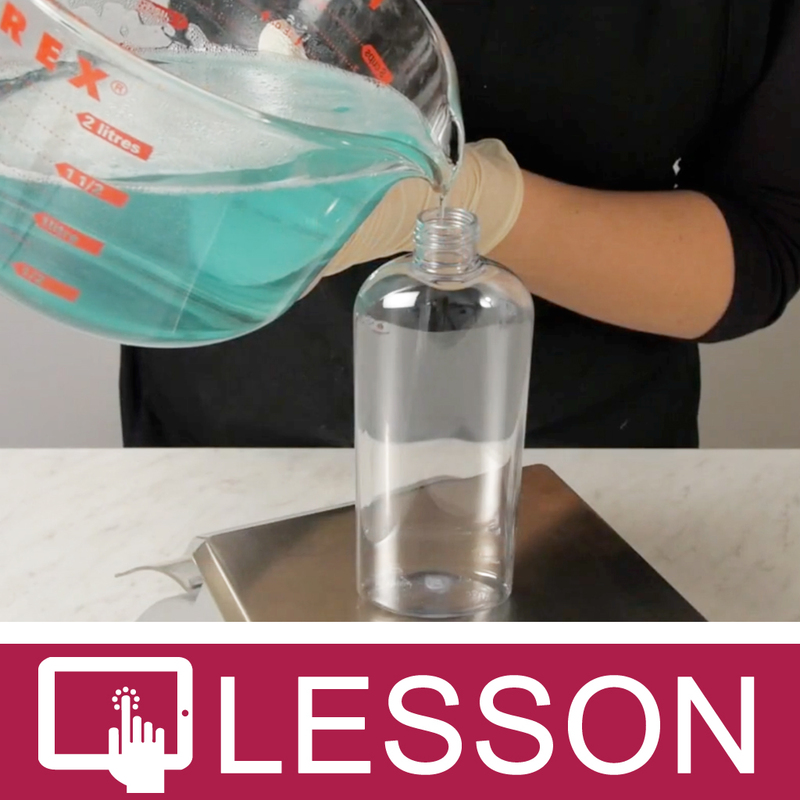 Using a pre-made Luxury Body Mist II base designed for handmade body sprays, measure 16 oz in a clean glass pyrex cup. Note: 16 oz of base will make approximately (2) 8 oz bottles, (4) 4 oz bottles or (8) 2 oz bottles of body spray. Fragrance - You can incorporate 1 to 2 teaspoons of fragrance oil per 16 oz of body spray base. Stir well. Notice that the more fragrance you add the more likely it is that your body spray will thin from the fragrance oil. If you want to add essential oils you can add 1 to 2 ml of essential oil per 16 oz of body spray. You will need a plastic dropper to measure small amounts such as milliliters. Stir well. Color - After you have scented your body spray it is time to add the color. You can add as much cosmetic color to your base as desired. Stir well. Note: Do not add so much color that the skin is stained. The body spray should always remain white when being rubbed into the skin. If it is colored then too much color has been used. Measurement Notes: 1 teaspoon = 5 ml. Pour your body spray into bottles and close with a body spray pump, disc top or cap. If the body spray is thicker you may find a jar with top easier to fill and use. If your body spray is thick and you wish to use a bottle you can slowly heat to 130º and pour into the bottles. Heating much higher than this risks degrading the preservative system and may allow your body spray to grow mold, bacteria or yeast. If selling your body spray you will need to label it with the product name, your company name, contact information, ingredients, directions for use, and bar weight. This product is intended to be crafted by those 15 years or older. You are expected to take full responsibility for your own personal protection and safety including but not limited to the use of protective clothing such as an apron, goggles, gloves and a hair net. "Hi I I noticed that is no FO/EO modifier added in this recipe . I just purchased this Body Mist Modifier II, and when I added the FO/EO modifier is very milky and separates after awhile any reason why this is happening I do not want to waste my product I was very excited to add it to my line but now idont know Thanks Rosy Blanco"
Staff Answer It is not necessary to use the FO/EO Modifier with the Luxury Mist. It does need to be added to the Body Splash. If you find that a fragrance does separate in the Luxury Mist, you may need to add the modifier, but be sure to use according to directions.